HOUSTON — A slightly dazed group of college students they stepped off a ZERO-G plane to resounding cheers Thursday (April 10), pumping their fists to celebrate a weightless voyage packed with science experiments, including one test that sparked tiny balls of fire. "It just turns into nothing — suddenly there's just nothing," Andrew Beeler, an aerospace engineering senior at the University of California, San Diego, said after the flight, trying to describe the strange sensation of weightlessness. 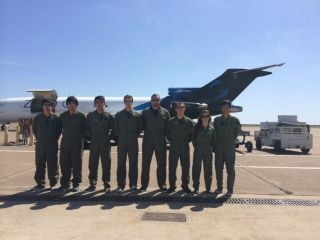 Beeler and two of his classmates, Henry Lu and Victor Hong, took part in Thursday's flight, which created brief periods of zero-gravity during 32 parabolas over the Gulf of Mexico. All three students were effusive about awesome the experience was. Lu showed me videos he took during the period of simulated Martian gravity (a third of the pull of Earth), in which he did pushups with remarkable ease and other students bounded off the cabin floor. Today it's was my turn. I've been drinking a lot of water to stay hydrated and I've been trying to internalize the "Feet down, coming out!" command I'll hear when I need to lie down or sit up straight, preparing to get pinned to the floor during a period of hypergravity when the plane starts pulling up for its next parabola. I'm also excited to watch how the students' experiment plays out in real-time. On Thursday, the first group of UCSD flyers lit tiny droplets of ethanol and kerosene (separately) inside of a triple-contained box. I'll see three of the other UCSD students ignite butanol and E85 (a combo of ethanol and gasoline), creating small fires that are shaped like little orbs when they're free of gravity's pull. Editor's note: You can follow the progress of this week's NASA Microgravity University Program flight via the program's Twitter feed @NASA_RGEFP and by following the hashtag #DefyGravity. Follow Megan Gannon on Twitter and Google+. Follow us @SPACEdotcom, Facebook or Google+. Original article on Space.com.